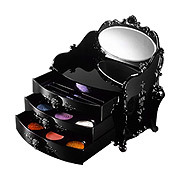 wow Anna Sui celebrating their 10th Anniversary and they are taking orders for this really nice set! 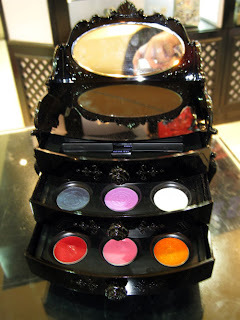 I went to check out this thing at U-Parkson One Utama but to my horror this collection cost rm599 !! my eyes almost pop out of my face when I heard that. I ask the SA again is it rm599 really? the SA must be thinking I am so poor? it's so sad, this so beautiful but rm599 can buy a lot of perfume already from Anna Sui to feed this girl for 10 years. ARGH why must be it rm599? it's insane!! yea about that, but it's too pricey! a flight to bangkok wow are you getting over the fear of flying and leaving Jamie as the only chicken who can't fly!??? Jamie thinks it is like everything some times things are worth the splurge other times what you spend is not always equal with all the other things one can get! yes jamie :) u r right..